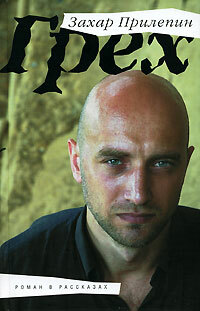 Today Zakhar Prilepin’s Грех (Sin) won a special edition National Bestseller Award, the SuperNatsBest; the shortlist consisted of NatsBest winners from the past 10 years. The SuperNatsBest celebrates the prize’s tenth anniversary. Prilepin received a staggering $100,000 for Sin, a novel in short stories/collection of linked stories that won the NatsBest in 2008. The 2011 NatsBest winner will be announced on June 5. I read Sin in 2008 and enjoyed it very much, despite my usual (and admittedly irrational) preference for novels over short stories. Three of 11 SuperNatsBest jury members – politician Irina Khakamada, writer and political activist Edward Limonov, and writer Leonid Yuzefovich – voted for Sin. I’ve only read and finished two other books on the list: Andrei Gelasimov’s Steppe Gods (previous post) and Mikhail Shishkin’s Maidenhair (previous post), both of which are scheduled for release in English translation in 2012 from, respectively, Amazon Crossing and Open Letter. Marian Schwartz is translating both books. I have a lot of other NatsBest winners on my shelves: Il’ia Boiashov’s Путь Мури (I think the intention is Muri’s Journey), Viktor Pelevin’s ДПП (NN) (Oh my, this works out to Dialectics of the Transitional Period (From Nowhere to Nowhere)), Garros-Evdokimov’s [Голово]ломка (available in Andrew Bromfield’s translation, from Vintage, as Headcrusher), Aleksandr Prokhanov’s Господин Гексоген (Mister Hexogen), and Leonid Yuzefovich’s Князь ветра (Prince of the Wind). According to OpenSpace.ru, Viktor Pelevin, who’s very reclusive, did not show up at the ceremony as promised, though Oleg Kashin’s Live Journal (ЖЖ) entry says there are claims that Pelevin was there but nobody saw him. (I wonder if this may be a recurring theme, kind of like Elvis or Bigfoot...) Kashin’s blog post also contains congratulations, a photo of Prilepin holding a brick of dollars, and the hope that Prilepin makes it home to Nizhnii Novgorod без приключений, without adventures/incidents. Up next: Notes from BookExpo America. I’m a couple days late in writing about the Big Book Award shortlisters but think I have a good excuse: the list was announced on Wednesday, and my day ended with an event that included a reading from Ol’ga Slavnikova’s Лёгкая голова (Lightheaded), one of the 10 finalists. Ol’ga Slavnikova: Лёгкая голова (Lightheaded or A Light Head) (read part 1) (read part 2) (previous post) Also: I asked Slavnikova how much the journal version of the novel varies from the print version, and she said, essentially, that it’s shorter but covers the same material. She made the cuts herself. Here’s the list, with publishers noted, on the Big Book site. Winners will be announced in November. I’ll leave analysis of age and previous prizes to the Russian blogger known as заметилпросто. Among the observations: there are no young writers (though three are in their 40s, hmm), no nonfiction made the list, and Bykov has already won the Big Book. And Arabov has won an award for screenwriting – at Cannes, no less – but never for a book. Update: All the books are available online, in Bookmate for four platforms, on IMHOnet in coordination with Big Book. Up Next: A bit of news from this week’s BookExpo America then Vsevolod Benigsen’s ГенАцид (GenAcide). I love novels like Mikhail Shishkin’s Венерин волос – the title means, literally, Venus Hair, and Marian Schwartz is translating it as Maidenhair for Open Letter, for the fern the name denotes – that seep into my thoughts and occupy my mind so much that any other reading, whether a newspaper or another book, feels like an intrusion. I’ll try to explain without giving away too much… I enjoyed Maidenhair’s unexpected twists and transitions so was glad I didn’t know many specifics before I began reading. And that, dear readers – along with attendant marriages, births, bust-ups, ambitions, aging, and finding balance in the world – is how I see the crux of Maidenhair. A richly stitched, multi-layered homage to the coexistence of love and death. (NB: Without Woody Allen.) One other thing: Maidenhair also reminds that we, along with the stories we live and tell, repeat, like doubles. Shishkin reinforces the importance of our written stories in several ways. Characters mention written records and repeat old stories (I’m not telling). And the interpreter visits the remains of St. Cyril, co-creator of Cyrillic, in Rome, because those letters mean so much to him. Rome, as Eternal City, by the way, plays an important role in Maidenhair. So do belly buttons. Yes, Maidenhair lacks a single unified plot and its story threads, knitted together by history, chance, and archetypes, sometimes wander. A lot, which can make the reading challenging but very rewarding. Two characters anchor the novel: a Russian speaker who interprets immigration interviews for Swiss authorities and a female singer named Izabella. We read Q&A sessions, we read of the interpreter’s family problems, and we read Izabella’s intermittent diaries, where we witness her growth from gushing teenager to a wife resigned to a husband’s infidelities. Though the book’s structure and histories may sound complicated, despite familiar tropes, even Shishkin says the core is simple. Shishkin says in an interview in Contemporary Russian Fiction: A Short List: Russian Authors Interviewed by Kristina Rotkirch, that Maidenhair presents the concept “that life is not only in Russia, life is not only fear and is not at all to be feared – life is to be enjoyed.” At the 2011 London Book Fair, Shishkin likened Maidenhair and Взятие Измаила (The Taking of Ishmael) to conversations he hadn’t had with his parents. I heard Shishkin say that before I read Maidenhair, and I found the thought particularly moving after I read the book and felt the cathartic effect of its portrayal and cataloguing of the kindnesses and brutalities that life -- and thus our parents -- give us. Of course boots are pretty important to a soldier, but his meaning is clear: the minutiae of life are fine but death, the underlying main thing, is off the list. Things probably aren’t so different for civilians. After staring at Maidenhair’s spine on my shelf for more than a year, a bit afraid of it after hearing its reputation for difficulty, I’m happy I read straight through without researching too much as I read. It’s not that I felt lazy: I think it was important to accept the book’s flow – Maidenhair has such a mesmerizing flow that one friend likened it to a fountain – so I could appreciate the cumulative emotional effect and heady surprises of all those drops, lives, histories, people, stories, and words that Shishkin piles on. Though I picked up plenty of references, I know I missed nuances (and more) because of my lopsided knowledge of history and classics, but I’ll save a detailed analysis of Maidenhair’s shards of history, mythology, language, and, yes, Rome for another reading. Also: Maidenhair won the National Bestseller prize in 2005. Level for Non-Native Readers of Russian: Close to top difficulty, though some portions, particularly the diary, are easy reading in terms of bare vocabulary. Up Next: A BookExpo America news post. Vsevolod Benigsen’s ГенАцид (GenAcide). Disclosures: The standard stuff applies. I’ve thoroughly enjoyed meeting and talking with author Mikhail Shishkin and translator Marian Schwartz. I’ll be meeting publisher Chad Post of Open Letter for the first time next week at Book Expo America; I’ve enjoyed several books I’ve received from Open Letter, including Charlotte Mandell’s translation of Mathias Énard’s Zone… Maidenhair reminds me a bit (or even a lot, depending on my mood) of Zone. Finally, Natasha Perova, with whom I’ve collaborated, gave me a copy of Contemporary Russian Fiction, which I’m finding very useful. Image credit: Maidenhair fern in Parco dei Nebrodi, Sicily, from tato grasso, via Wikipedia. Ah, Vanity! Ah, Spring (Cleaning)! Today’s spring cleaning included clearing out a blog-oriented corner of my head… I read Aleksandr Snegirev’s Тщеславие (Vanity) last month but, thanks to lots of awards news, hadn’t gotten around to finishing sweeping impressions out of my brain and into a blog post. Dimka, of course, ends up a finalist for a prize suspiciously similar (so “they” say) to the real-life Debut, which Snegirev won for short prose in 2005. Golden Letter finalists from all over Russia are bused to a дом отдыха (rest house) outside Moscow where they spend days together discussing writing. For me, much of the book’s humor came from the setting: I remember the bad food, odd smells, strange habits, uncomfortable beds, and forced jollity of gatherings at rest houses and similar places. Some of Snegirev’s details – like a stairway that resembles холодец (basically meat Jell-o) and waitresses carrying huge stacks of glasses – induced flashbacks. Perhaps most interesting is that Dimka doesn’t narrate Vanity, one of his friends does, relating intimate stories of what happens to Dimka at the rest house. Thus the stories, allegedly Dimka’s experiences, are filtered through Dimka’s memory and his friend’s imagination, removing the stories further and further from what “really” happened and reinforcing the novel’s themes of lying and narrator reliability. Like Snegirev’s Petroleum Venus (previous post), Vanity is generally well-paced, human(e) mainstream fiction with lots of observations about contemporary Russian society. There are many more scenes in Vanity that I could mention – some are rather madcap – such as Dimka’s meeting with a favorite childhood writer, the effect of the world financial crisis on the prize, the reputed ghost of Arsenii Tarkovskii, a variety show with a World War 2 theme, and an established writer declaring he doesn’t like contemporary fiction. Ah, vanity! Level for Non-Native Readers of Russian: 2.5-3.0/5. Includes some slang, but the story is straightforward, well-balanced, and easy to follow, making Vanity easy to read. Up next: Mikhail Shishkin’s Венерин волос (Maidenhair), which I just finished. Maidenhair took over my head, in a very good way, for several weeks. Then Vsevolod Benigsen’s ГенАцид (GenAcide), which one of you recommended. Disclosures: Aleksandr Snegirev is a friend on Facebook but we’ve never met in real life. 2. A Московские Новости interview with writer Oleg Pavlov mentions that Pavlov’s trilogy Повести последних дней (Tales of Recent Days) will be published in English translation by And Other Stories. The first two books of the trilogy, in an edition that Oleg kindly brought to London for me, are waiting on the Bookshelf. Pavlov’s interview answers are quite candid as he discusses presentations at the book fair, reactions to the Russian booth, and politic aspects of who goes abroad to fairs. Pavlov also says only three social novels came out of the noughties: his own Asystole/Flatline, Zakhar Prilepin’s Sank’ya, and Roman Senchin’s The Yeltyshevs. I’m sure I’d think of another title or two to offer for consideration if I went through my blog archives but – given my admiration for (and work on) Senchin’s book, my appreciation for the difficult but very affecting Asystole, and Sank’ya’s up-close look at political opposition and violence – I would certainly agree that these three novels are some of the decade’s most important social prose. They form a bleak triptych of various types of post-Soviet social breakdowns and disconnects. 3. Meanwhile, the book fair circuit continues: Russia is the guest country at the Salone Internazionale del Libro di Torino, which opens on giovedi, 12 maggio. And what better way to practice your Italian than reading the program? Some of the same writers who were in London – e.g. Liudmila Ulitskaya, Mikhail Elizarov, Zakhar Prilepin – will be there, as will Sasha Sokolov, Viktor Erofeev, and Julia Latinina. And film director Aleksandr Sokurov. 4. Finally, for those of you who will be in the New York area in late May: Causa Artium will host Olga Slavnikova in events on May 20, 22, and 25 in, respectively, Jersey City, Brooklyn, and Manhattan. Marian Schwartz, who translated 2017, will participate in the event on May 25, in Manhattan. I’ll be there, too! Each Slavnikova event will be followed by a “New Faces, New Voices: Rising Stars of Russian Writing” program featuring four winners of the Debut Prize. I enjoyed hearing two of these writers speak in London so will make sure to have an extra afternoon coffee so I can stay for the second half of the evening. And stay awake after a day at Book Expo America. All the events are free. RSVP on Causa Artium’s Facebook listings, if you’d like. Up Next: Aleksandr Snegirev’s Тщеславие (Vanity), then Mikhail Shishkin’s Венерин волос (Maidenhair). I found in Bro, like Ice, an irritatingly readable book that I didn’t especially like. I couldn’t put either book down (despite repetition), but Sorokin’s abstractions, though effective on one level, make the books feel, to echo what other readers have told me, a little soulless (intentionally?) even when they compel me to keep reading. And both times I had that sinking Peggy Lee feeling of “Is that all there is?” So… In Bro, the title character narrates his life story: born the day the Tunguska meteor hits, goes on Leonid Kulik expedition to site, knocks heart on ice, realizes he’s found his true self. Now he must find 22,999 others like him who are also capable of speaking with their hearts, eating a raw vegetarian diet before it’s trendy, seeing the rest of Earth’s population as meat machines, and being saved during that rapture I mentioned above. Bro begins by finding Fer, Eve to his Adam. Part of the paradox of Bro and Ice is that they seem silly – the pulpiness NYRB mentions is obvious, with calendar pages tearing off and heart-related passages so cheesy I wrote “oy” in the margins – as they examine the nature of a group that considers itself chosen and allowed to do anything. (I doubt it’s coincidental that Dostoevsky is involved when Bro dreams about a book…) It’s okay to kill, reason is bad, and books are just paper covered with combinations of letters. Bro sees himself as part of a war to free his brothers and sisters, people of light, from the dark, meat machine masses. Bro’s group are higher beings, enlightened, as it were. It’s notable that Bro’s stylized language changes over the course of the novel. The book’s opening reads like a classic Russian narrative of childhood and youth but Bro’s last quarter contains, for example, a passage about World War Two that mentions the country of Order, the country of Ice, the country of Freedom. Freedom and Ice beat Order. Weapons are metal pipes. Oh, those meat machines! Another passage also uses остранение, defamiliarization, to describe movie screenings in Germany: a box projects shadows onto white material. It reminded me a bit of Natasha Rostova’s trip to the opera in War and Peace. Bro brings out the hard, cold totalitarianism of Bro and his crew, showing us how they find siblings in the Soviet and Nazi systems and use their infrastructures. In the Soviet Union, they cruise the streets looking for brothers and sisters, arresting them so they can pop them in the hearts and show them their true natures and make them happy, too. And that’s where Bro and Ice are most interesting: showing how the ice people’s activity parallels and intersects with that of real-life totalitarian regimes. Of course Bro’s people are more chosen than the political regimes’ chosen, and their intentions are (even more) purely selfish: their source and inspiration, after all, are celestial, from meteorite ice, a piece of another world. I could go on and on about Bro and Ice but will just add a few notes: A big caveat: I’ll repeat that I haven’t read 23,000, which apparently Changes Everything. 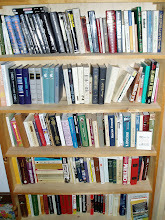 (See Daniel Kalder’s piece on Publishing Perspectives about Sorokin and the trilogy. )… I think New York Review Books did the right thing by placing Bro first in the trilogy book, even though it was written after Ice… According to an article in yesterday’s New York Times, Sorokin once said literature was just “paper with typographic signs,” thoughts rather like Bro’s… Do I recommend the Ice books? Sort of. If you enjoy abstract novels of ideas with science fiction elements that read easily and offer plenty of oddity, they may be right up your proverbial alley. It’s taken me a few years and a few books to edge into Sorokin’s world. Level for Non-Native Readers of Russian: 2/5 or 2.5/5 for the reading and words themselves: the book reads fairly easily and quickly. Up Next: Aleksandr Snegirev’s Тщеславие (Vanity). Then Mikhail Shishkin’s dense Венерин волос (Maidenhair). I’m also looking forward to reading Catherynne M. Valente’s Deathless, which I bought at a reading a few days ago. Valente’s site calls it “a bold retelling of a Russian fairy tale about Marya Morevna and Koschei the Deathless set in Stalinist Russia.” Publisher Tor has excerpts here. 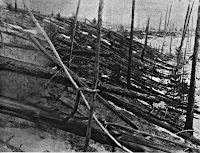 Photo credit: Tunguska event site, 1927, photographed by Leonid Kulik’s expedition. I thought the expedition scenes in Bro were a highlight.